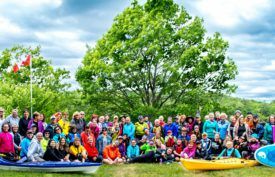 Ontario Sea Kayak Centre is excited to be hosting Paddlepalooza, the largest annual sea kayaking event in Ontario, for our 8th year in Parry Sound. 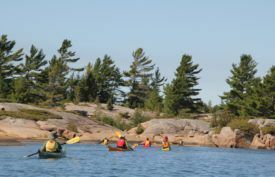 Parry Sound’s proximity to the open waters of Georgian Bay, the moving waters of the Moon River and the sheltered inlets of the Sound, make Parry Sound the ideal location for hosting Paddlepalooza. 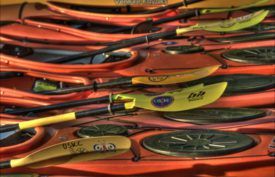 We bring together the best sea kayak instructors from some of the top paddling schools in Canada and the United States for this spring tune-up event. 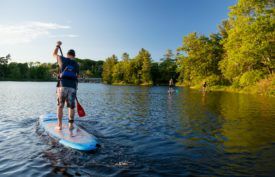 We welcome paddlers of all skill level to Paddlepalooza and offer skills clinics for every level of paddler from complete beginner to rough water paddling and rolling. 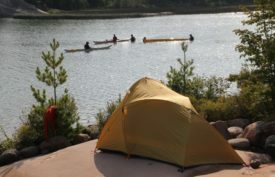 Paddlepalooza starts with a campfire and snacks on Friday evening, arriving anytime after 1600. Meals begin with Saturday breakfast and are included until Sunday lunch. Feel free to bring snacks and BYOB for the campfire. You can optionally choose to arrive on Friday morning and take a whole extra day of instruction. No Greenland Camp this Fall!? 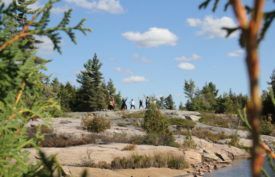 That’s right we are making Ontario Greenland Camp a bi-annual event so the next event will be in September 2020. However this year at Paddlepalooza we have Tim Gallaway, a regular OGC mentor coming to teach Greenland rolling, rope gymnastics and harpoon throwing on Friday and Saturday! This year we are offering two options for the weekend and the option to join us on Friday for an extra day of coaching. *Couples booking option 1 who would like more privacy. Let us know as we have a few sites for tents if you prefer. This includes your event pass for both Saturday and Sunday, kayaking clinics, parking and launch fees at off-site locations, meals from Sat breakfast to Sun lunch. 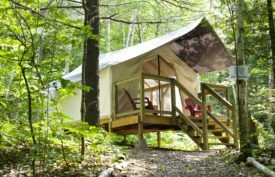 But you either live in Parry Sound or have accommodation available locally to you. The Granka Band: Live Music Saturday Night! BYOB, You will drink responsibly. You have the option to leave your car on site. Moon River Currents – Meet at the moon river for a day of current practice and skill development. 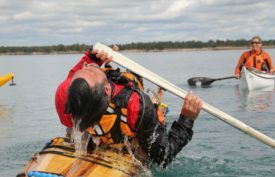 Learning on the Move – We’ll explore ways to challenge ourselves and work on skills on a Georgian Bay journey, and provide you with ways to develop your paddling skills on your everyday paddles. Greenland Skills – Work with Tim on Greenland strokes, rolls, and other traditional skills. Arrive anytime from 1600 onward at Camp Tapawingo Register/Paddle/Socialize! Go to town for dinner or bring a dinner picnic! Load vehicles for offsite classes tomorrow. Morning briefing and packed lunch pick-up. Travel to launch points for day. Late afternoon Sessions-Back at Tapawingo. Join us in this full day session in the currents of the Moon River. Surf and play in the currents in this outstanding venue with our experienced instructors. A student’s favourite, this class is a great way to start the season by stepping outside your comfort zone in a safe environment and having fun. 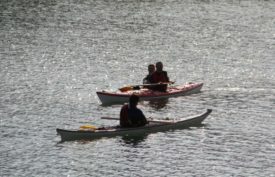 This course is suitable for paddlers who paddle at least a PC Level One skills which is the equivalent of BCU 2 star. You should be comfortable with your wet exit and assisted rescue. A dry suit or wetsuit is a must, as well as a helmet. Participants will carpool to the launch point, which is about a 45-minute drive to launch from Camp Tapawingo. Kayaks will be transported on the trailer if necessary. Lunch will be provided. 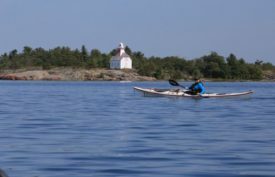 This session is for beginner kayakers who want to start playing in moving water. The Seguin River provides us with a gentle current to start experiencing what it’s like to move in and out of the current and then practice assisted and self-rescues in the moving water. The day will begin with a rescue review in calm waters and then the group will slowly move into the current as skills improve. 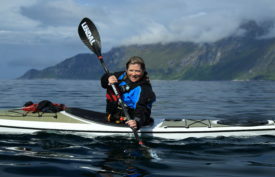 Kayak touring involves thinking a few steps ahead and having the skills and knowledge to explore safely and effectively. 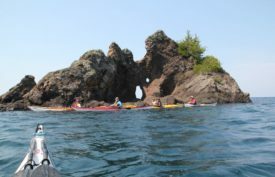 This session is a chance to get out to paddle on the beauty of the Bay while working on our intermediate kayaking skills and touring techniques. We have Oak Point as our launch site. 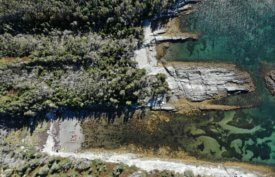 Oak Point gives us the opportunity to navigate in a complex archipelago. We will begin our day with some navigational and sea state theory on shore and then practice along the way. You will learn how to follow a heading, plot a course, take a bearing, use a range and get a feel for piloting. 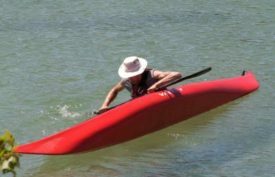 Along the way, you will have the opportunity to improve your paddling techniques with strokes review and boat control. Strokes practice will include a touring forward stroke, the bow and stern rudder, as well as hanging draw and pivot turns. Kayak control using edging and bracing will be work-shopped as well. 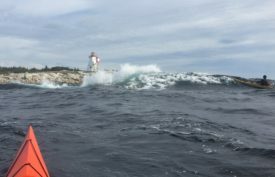 You’ll then discuss the tactical application of these strokes in wind and waves and work on blending these strokes and combining them with edge control and techniques that will help you control your kayak in more challenging conditions. 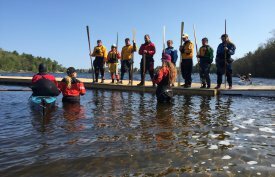 This course is for paddlers who are Paddle Canada Level Two ability, or are moving towards their Level Two. PC L2 is the equivalent of BCU 3 star. It will not be necessary to get wet on this course, however, the possibility is always there, so a dry suit or wet suit is required. You should bring a change of clothing, water bottle, personal snacks as well as all required kayak and safety gear. You should also bring a watch, a waterproof notebook and pencil, compass (deck and/or orienteering). Small laminated charts of the area will be provided for you. Participants will carpool to the launch point, which is about a 30-minute drive to launch from Camp Tapawingo. Kayaks will be transported on the trailer if necessary. Lunch will be provided. 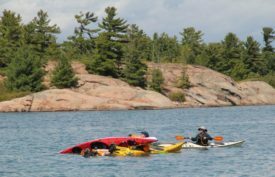 Have you ever wondered what to do when a kayak is sinking? Or if you lose a hatch cover? Or if someone blows a shoulder? What if someone capsizes against the rocks? Or multiple people capsize at once? Ever had a sea-sick paddler along? How do you land in difficult or risky situations? Our day on the Bay will be full of what to do when the “storm” hits the paddler. How do you manage when something doesn’t go according to plan? We will have fun with scenarios to help us establish protocols for rescue situations. Who do we take care of first? Who do we worry about most? What resources do we have available to us? 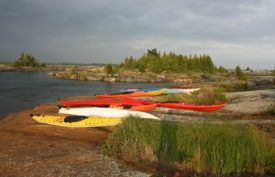 This course is for paddlers of Paddle Canada Level Two or Three ability, or BCU 3 or 4 star. A drysuit is necessary as well as a tow system and of course all required Transport Canada safety gear. Participants will carpool to the launch point, which is about a 30-minute drive to launch from Camp Tapawingo. Kayaks will be transported on the trailer if necessary. Lunch will be provided. 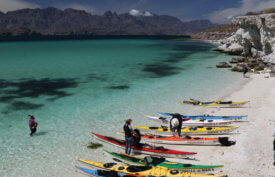 This full-day session is where to begin with kayaking. You have the opportunity to achieve your basic kayak skills certification over this day ang it continues on Sunday morning. We will begin with how to launch and land your kayak safely and end with a rescue clinic. We will spend the day getting comfortable with all of the fundamental strokes, rescues and navigation of kayaking. Balance and comfort in the kayak. Wet exit and assisted re-entry skills. Essential gear for sea kayaking. 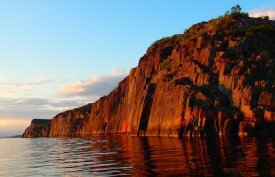 We’ll do all this while exploring the beauty of the Big Sound waters. Along the way, we’ll learn how to paddle safely when there may be a boat channel, boat traffic and other obstacles to avoid. We will be getting wet in the afternoon so a wetsuit is recommended if you have one. Bring along everything you need for a day on the water. Sunscreen, water bottle, hat and personal snacks. Lunch will be provided. 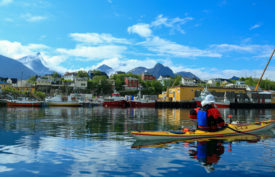 Thinking about trying Greenland traditional style kayaking? Then, this is the perfect course for you. Spend the morning learning the basics of how to paddle with a Greenland stick. 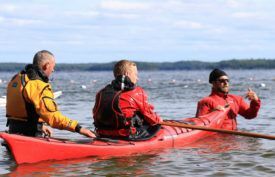 You’ll learn how to manoeuvre a kayak using edging, strokes and bracing, By the end of the morning, you’ll have develop an understanding of how the boat, paddle and water interact. Paddlers will work to develop low and high brace recovery strokes; as well as, learn that sculling is just about playing with degrees of wetness. After lunch, you will begin to learn why the Greenlanders are the masters of the roll. You will work on learning to roll or for those having a solid roll, you may learn a new one. We will also cover side sculling, balance brace and if we have the time, re-enter and roll. If you’ve learned your first roll in the pool this winter, or couldn’t get in to a pool clinic because they were all sold out, then this is the perfect course for you. Greenland paddles will be provided for those who need to borrow one. A wet suit is strongly recommended as well as a nose clip and goggles. Meet Tom Froese our Greenland Paddle making professional. Tom will demonstrate the different techniques he uses to craft his world-class paddles. Leave with all of your questions answered and best practice tips so you can create your own at home. After meeting Tom, you’ll probably just book a private paddle build class with him just so you can hang out and share some more laughs together! Eventually, most kayakers end up owning a drysuit or drytop and eventually the gaskets will fail. In this workshop, you’ll learn the tips and tricks you need so you can fix your own gaskets and save spending even more money on staying dry! Knowing effective knots and tarp hanging techniques are key to staying dry, comfortable and safe while on trip. These coaches are the masters at hanging tarps, packing effectively and staying comfortable on trip. Spend the afternoon getting tips, ideas and skills and you’ll be dreaming of getting out into the wild! Yoga for complete beginners, don’t worry if you’re tired, we’ll take it easy and just stretch out those hips and backs from the day before. Get back in that kayak as quick as you can! We will be getting wet and scrambling fast in this session. By the end of the morning, you will be a master of your self rescue skills. Suitable for kayakers who already know how to self rescue and want to improve their speed. 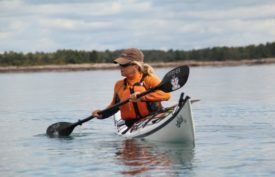 In this session you will practice techniques to edge your kayak for more effective paddling in wind, waves and avoiding obstacles along the way. You will work on using the low brace, high brace and sculling brace to prevent a possible capsize. This class will help you refine your forward stroke with the aim of becoming more efficient so that you deliver power without wasting energy while paddling. Throughout the class you will learn new drills to take away that will help develop your technique into the future. You’ll also workshop the two different forward strokes, one for power and one for endurance. What’s the difference? Find out in this session! This session focuses on body, blade and boat awareness. 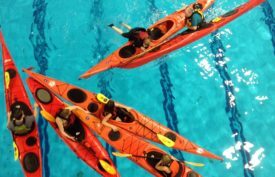 Using effective techniques throughout a range of advanced strokes, drills and games, you’ll gain confidence and maneuverability while having loads of fun.This session is suitable for paddlers who are already comfortable with the fundamental strokes of kayaking. This morning is the final clinic in the Paddle Canada Basic Skills course. To achieve tour certification you must attend all day Saturday as well as this Sunday morning clinic. For anyone who wants to learn to roll! Nothing feels sweeter than solid sculling in a kayak. Nothing is more relaxing than staring at the sun in a balance brace and nothing could increase your safety more than having a solid re-enter and roll. Be prepared to get wet while mastering these skills with the masters. This session is suitable for kayakers who are comfortable hanging out upside down and want to get better and being above the water. 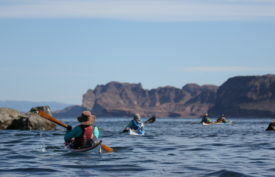 Are you someone who paddles with a group? Do you sometimes play the role of leader? Do you know when you should be an effective follower? 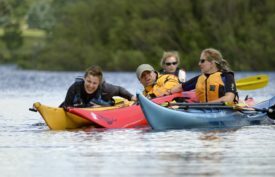 Increase the strength and safety of your group paddles by learning how to manage group incidents and rescues in an effective and safe manner. What’s the difference between Coastal and Great Lakes Navigation? What’s the difference between a map and a chart? What are aids to navigation? What’s ebb and flow, high and low? Is there lightning in BC? What’s with that? 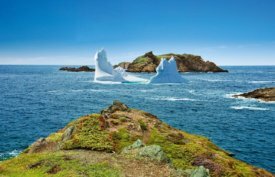 The experts on both share their knowledge to get you started on planning your next adventure on Superior or Georgian Bay, Clayoquot or the Bay of Fundy. Take exit 224 off of HWY400. Head west towards town, take a left on Great North road, right on Emily St then left on Glenn Burney road. 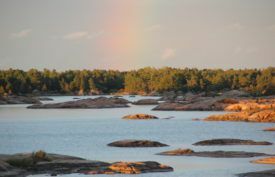 You can bus to Parry Sound on Ontario Northland bus service. Someone can pick you up from town and drive you out to camp. Please contact [email protected] to arrange this. If you can’t make the Paddlepalooza party, we offer an array of kayaking courses. Just click “Courses” in the tab above. Live music Saturday night - Mike Granka Band. 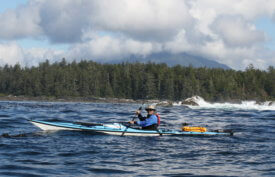 A full touring kayak with double bulk heads, kayaks are available for rent, please contact us for details. All Transport Canada required safety gear as well as a skirt and paddle float. Spare paddles available to lend upon request. Other personal items for comfort such as extra snacks, sunscreen etc.